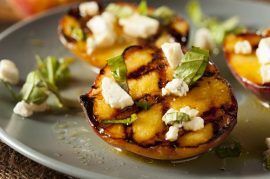 If you’re looking for a warm, simple dessert that amplifies a peach’s natural flavor, then you need to check out these Manuka honey roasted peaches as soon as possible. This recipe produces flavorful, tender peaches using a sweet but light glaze thanks to Manuka honey, and it fortunately only requires a few simple kitchen appliances to get the job done, including a 12-inch skillet that’s safe for ovens and a serrated peeler. Whether you serve them as is, with Greek yogurt, or with vanilla ice cream, these peaches will leave you wanting more until there’s nothing left to share with anyone else. If this is the recipe for you, let’s get started! Total Time: 40 min. Yield: Six servings. First, adjust your oven rack until it’s about six inches away from the heat broiler and broiler element. Combine the sugar, the salt, and the lemon juice in a large bowl before adding the peaches and tossing to combine. Make sure you coat all of the peaches’ sides with the sugar mixture. Move your peaches, with their cut sides up, into a 12-inch skillet that’s safe for ovens. Pour what remains of the sugar mixture in the peach cavities, and then pour the water around the peaches in the skillet. Broil them until the peaches just begin to brown, which should take between 11 and 15 minutes. Combine the Manuka honey and unsalted butter in a bowl, microwaving until melted for roughly 30 seconds and then stirring to blend fully. Remove the peaches from the oven and start brushing half of the honey mixture on the peaches. Return them to the oven, continuing to broil till they’re spotty brown, which should take between five and seven minutes. Once the peaches are ready, remove the skillet from the oven, brush the peaches with the rest of the honey glaze, and transfer the peaches into a serving dish (make sure to leave the juices behind). Bring the accumulated juice within the skillet to a simmer on medium heat, cooking until it’s syrupy for roughly one minute and then pouring over the peaches. After sprinkling on the hazelnuts cheese, they are ready to serve. Nutrition Info: 155 calories, 47 from fat; 5g fat (1g saturated; 0g trans); 5mg cholesterol; 98mg sodium; 28g carbohydrates; 3g fiber; 25g sugar; 2g protein. Need to order some Manuka honey to make this delicious recipe? Click here to get your order started and remember, we offer FREE shipping on all orders of $150 or more.